Environmental innovation is laudable, as the AGS Group reinforced through its sponsorship of a recent expat awards ceremony in France. 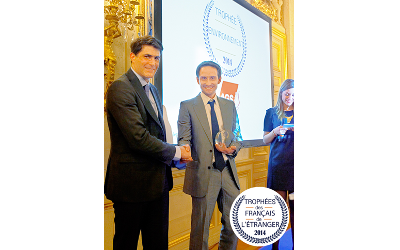 ‘Trophées des Français de l’étranger’ (‘Trophies for French Expatriates’) rewards the experience of seven exceptional French expatriates in seven categories, and was hosted recently at the French Ministry of Foreign Affairs in Quay d’Orsay. Organised by ‘Le Petit journal’ – an online newspaper for French expatriates and Francophone readers abroad – the event was attended by Hélène Conway-Mouret, France’s Minister Delegate responsible for French expatriates. AGS was invited as the event’s ‘Environment Category’ sponsor, and represented by Sophie Lucas, Gil Le Menes, Dorina Dama and Benoît de Moncuit. After a speech presenting the AGS Group’s commitment to environmental sustainability, Benoît de Moncuit (AGS France’s CEO) presented the ‘Environment Trophy’ to Jérôme Chanson for the development of an ecological carwash in the Netherlands, Greenest Carwash. AGS contributes to numerous sustainability projects, including its unique ‘One Move = One Tree’ campaign and the United Nations Global Compact, and demonstrates its full commitment to environmental safeguards through its involvement in events of this nature.